Archaeological dig sit of the pre-Islamic Christian settlement on Bani Yas. Sir Bani Yas island is a sprawling wildlife reserve larger than the island of Abu Dhabi and home to a vast array of wildlife. SIR BANI YAS ISLAND // One of the most significant archeological finds in the Gulf is about to reveal important details about life 1,400 years ago. The remains of a Christian monastery and church on Sir Bani Yas Island, believed to have been settled around 600 AD by a community of 30 to 40 monks, opened for public viewing on Saturday. The site, unearthed in the early 1990s, is believed to be the only permanent settlement ever established on the island, and researchers said the find has valuable historical and religious significance. "Twenty years ago, we had no idea that Christians came this far south and east in the Arabian Gulf," Dr Joseph Elders, the project's archaeological director, who began excavating the site nearly two decades ago, said yesterday as he led reporters on a tour of the site. "This shows that Christianity had penetrated far further than we thought before ... We don't have many monasteries from this period." The monastery complex, a multi-building compound located on the eastern side of the 87-square-kilometre island, is the only pre-Islamic Christian site known in the UAE. Discovered in 1992 during an archaeological survey, the monastery is believed to have been an important destination for pilgrims travelling along a trade route to India. "We think quite a lot of visitors came to the monastery," said Dr Elders. "These people wanted to be visited." A separate room for visitors was built within the monastery complex itself, where pilgrims could pray or leave gifts. Dr Elders, who is also the chief archaeologist for the Church of England, said the archaeological team believes the visitors might have been attracted to the site because it was founded by a saint, or holy man. The archaeological team has unearthed only one body at the monastery site, but the discovery was a significant one. The church was built around the grave, which might have belonged to the settlement's founder, the same local saint whose presence brought travellers to the island. "Academically, it's fascinating and really important," said Peter Hellyer, the excavation's project manager and a columnist for The National. "It explains a lot more about the heritage of this country. Most people wouldn't know that history, that there was Christianity here before Islam." Christianity spread throughout the Gulf between the years 50 and 350, following the trade routes. The inhabitants of the 7th-century settlement probably belonged to the Nestorian Church, or Church of the East. Researchers believe the wealthy community was made up of a mixture of people from along the Gulf, and local residents who spoke Syriac and Arabic. The community probably chose the site based on its location at the head of a natural sheltered harbour. Archaeologists have discovered 15 types of pottery at the complex. The complex itself comprises monks' cells, kitchens and animal pens surrounding a courtyard with a church dominating the centre. The artefacts, including bowls, jars, glass vessels and ceremonial vases, reveal that the monks had ties to modern-day Iraq, India and maybe Bahrain. The settlement remained until about 750 and appears to have been peacefully abandoned. As Islam's influence spread, the community probably diminished slowly as the monks struggled to find new recruits. 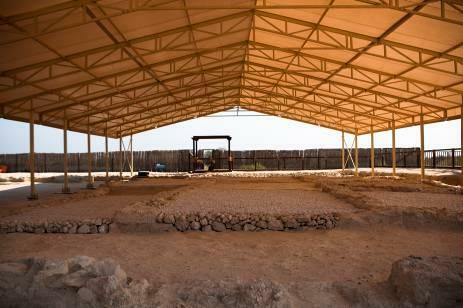 The newly opened archaeological site was excavated between 1993 and 1996 under the patronage of Sheikh Zayed, the founder of the UAE, who used Sir Bani Yas Island as a retreat. Fieldwork had been halted until 2009 when Sheikh Mohammed bin Zayed, the Crown Prince of Abu Dhabi, ordered excavation to resume. "We are delighted to be opening this ancient site to the public, which gives visitors an insight into the rich history of Sir Bani Yas Island and the UAE," said Sheikh Sultan bin Tahnoun Al Nahyan, the chairman of the Tourism Development and Investment Company (TDIC). "We are proud of our heritage and are therefore focused on creating a multi-experience tourism destination where guests are able to enjoy a variety of activities, while protecting and preserving the history and culture of our country, as well as the natural environment of the island." The 65-square-metre archeological site, which is enclosed within a protective fence and covered as part of conservation and preservation efforts, is part of an effort to highlight the history and heritage of the island. Envisioned as part of the Desert Islands tourism experience, a visit to the monastery could eventually be part of a heritage trail that would include other significant archaeological sites on the island. Developed by TDIC, Desert Islands is a collection of eight natural islands that boast a five-star resort and spa, a wildlife reserve home to more than 30 species of free roaming animals, and outdoor activities including mountain biking, snorkelling and kayaking. The monastery complex, including a sanctuary, nave, chapel and tower, is now open to the public, but further excavation on the site is expected to continue for several years. At least eight houses have been unearthed, and the team has recently begun excavating a new structure adjacent to the main monastery building. TDIC and the archaeological team are working to preserve the site, which could eventually include a visitors' centre and educational displays. "Opening the site to visitors marks an exciting tourism development for the island as we seek to discover and share more about the past lives and human stories that have played their part in creating its fascinating history," said Dr Elders. The team has been able to determine the use of each room in the monastery. A priest's door, decorated with plaster crosses and located at the south end of the monastery, led into a chapel and side room used for holding holy vessels. In this room, archaeologists found two circular holes in the floor most likely used to anchor a ladder that reached into a bell tower to announce the time of worship. A main room, used by the monks living in the settlement, and a narthex at the west end of the complex were probably the setting for services that included wine and unleavened Arabic bread. The main monastery building also included a niche for holy water and a brazier for cooking. Despite the details that the research team could glean from studying the artefacts, Dr Elders said the archaeologists still did not know many details about how the settlers lived. "They had several acts of worship a day," he said. "And they worked hard, mostly building work. They probably had goats, so they herded goats, transported water and made pottery." Notably, the small Sir Bani Yas Island settlement continued to operate even after the spread of Islam throughout the Gulf. That is a testament to the open-mindedness of the time, Dr Elders said. "That the monastery continued for at least a century after the arrival of Islam shows that tolerance of the Muslims quite close to their heartland," he said. "We know that there are stories of everyone living in harmony." 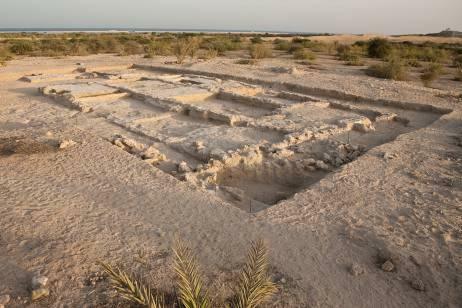 The earliest evidence of human settlement on Sir Bani Yas Island dates to around 7,500 years ago, experts said. More than 35 archaeological sites have been identified on the island, including settlements from the Stone and Bronze ages.